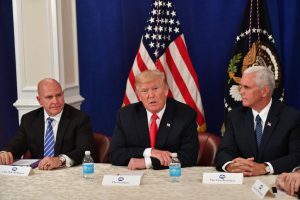 The New York Times reports: “Trump Settles on Afghan Strategy Expected to Raise Troop Levels.” Trump is scheduled to make a prime-time address on the Afghan war at 9 p.m. ET tonight. The U.S. government is launching “war games” targeting North Korea today. The New York Times reports: “Talk of ‘Preventive War’ Rises Over North Korea Issue.” RootsAction petition “Push back against Trump’s threats of nuclear war” has 13,000 signers. Managing editor of ZoominKorea, Lee said today: “North Korea legitimately withdrew from the Nuclear Non-Proliferation Treaty (NPT). Article X of the NPT says parties have the right to withdraw from the treaty if ‘extraordinary events have jeopardized their supreme interests.’ In 1993, after the fall of the Soviet Union, the United States announced that it was retargeting some of its strategic nuclear weapons away from the former Soviet Union to North Korea. Then, it conducted military exercises near the North Korean border involving tens of thousands of U.S. soldiers as well as B-1B and B-52 bombers and naval vessels with cruise missiles. In 2002, George W. Bush listed North Korea among seven countries that are potential targets of U.S. … nuclear attack. North Korea determined that these constitute ‘extraordinary events that jeopardize its supreme interests’ and followed the proper procedure as outlined in the NPT to pull out of the treaty. “The United States, on the contrary, is in violation of the NPT, which says parties to the treaty that have nuclear weapons should reduce their arsenal toward complete elimination. The United States spends billions of dollars each year to modernize its nuclear arsenals.